Is Your Online Brand Aligned with Your Personal Brand? There is no doubt that a recruiter’s reputation plays a significant role in landing a search. There are thousands and thousands of small recruiting firms in the United States that have built their companies one handshake at a time. Hopefully, as their reputation in a given market grows so does their business. While the need to create a trusted partnership with a potential client will never go away, the market is changing, and recruiters in companies both large and small need to develop their brand online. Hubspot released a report in May 2018 that stated, “77% of consumers research you and your company online before engaging with your brand”. Let me give you an example of this in action. Versique, Parqa’s sister company, recently acquired a recruiting firm with a very well-established leader in their market. He had an outstanding company and was doing excellent work for his clients. Several years prior he had placed a CEO in a company, and that CEO called him as he was retiring and was looking for help to fill his replacement. The experience he had with this recruiter was phenomenal, and the CEO referred him to the Board of Directors. A few weeks later this recruiter received a call from the CEO informing him that the Board of Directors chose to go a different route because they couldn’t find any information about his practice online. At this point, he knew the market was changing, and he had to do something different. He saw what Versique was doing to build online credibility not only to drive net-new leads, but to secure the reputation of its recruiters online; many of which have 15+ years in the industry. This is a real-life example of how a skilled recruiter, with an excellent reputation and the benefit of a referral, couldn’t close a deal because the Board of Directors could not learn more about him online. When I hear Parqa’s clients and potential clients say they can’t afford to spend more on digital marketing, or even entertain digital marketing at all, I tell them this story. Can you afford not to land a CEO search that on paper ten years ago would have been a slam dunk? There are two critical components of digital marketing that every recruiter and company HAVE to focus on at bare minimum in 2019. Making your website optimized for search engines to rank higher in organic searches. Writing content that targets your core audience and provides them with the information they find reputable and relevant. Generating leads by advertising with Pay Per Click campaigns. Build out your LinkedIn page to show relevant work experience, testimonials, and a professional picture. Build practice area pages on your website so that people can drill down to a specific vertical that you specialize in and understand better why you are the best choice. Have a very professional flow to your website so you look organized and professional. Make sure your website’s brand ties to the flow of your social media outlets. Alright, now you’re a master of aligning your personal brand with your online brand, right? Still have some work to do? Give us a call. Parqa specializes in providing recruiters with digital marketing services that enable firms to compete in today’s digital business landscape. 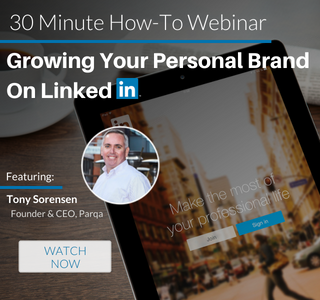 Watch Parqa’s Free 30-Minute Webinar: Growing Your Personal Brand on LinkedIn For Recruiters. LinkedIn is the go-to social network for recruiters, it’s never been more important to make sure your personal brand stands out online. Learn how to grow your business, and gain traction on LinkedIn, in this 30-Minute How-To Guide for Recruiters. Tags: Branding, Digital Marketing, Digital Marketing Strategy, and Social Media Tips.